Our next tournament is the annual Ernie Brown Memorial. Most of you, regrettably, never got to meet Ernie. He was as close to the perfect example of sportsmanship you could ever hope to meet. A true gentleman in every sense of the word. He loved the game of golf and his favorite was the two man best ball tournaments. So every year in honor of his memory we hold this tournament. A few of us take a swipe at dressing a bit like Ernie. If you'd like to try, just think 60's golf. You know... colors and patterns. Also, as in all of our past Ernie Brown Memorials... No foul language. We'll discuss the penalties later. So grab your partners one more time. This will be the last two man best ball for a few months. If you don't have a partner sign up early so I can find one for you. This is a fun time that you won't want to miss. April 5... Rumble In The Riverbed. Two Man Best Ball. Our SCGA partner's best ball qualifiers will be coming up in May, so we're having one now to get in the mood. This is where you and your partner each play your own ball on every hole and record the best player's net score for the hole. This is one of our most popular tournaments and a great way for new members to get to know the crowd. If you'd like to play and need a partner, I'll get you one. Email reminders will be coming out, so just respond that you'd like to play and I'll take care of the rest. Results For... You Against The Riv... Match Play. This was fun, but a bit of work to calculate post tournament. I've had several requests to do it again later. We'll see. 2nd place: Brad York won on hole 18 *. 3rd place: Jay Miller won on hole 18*. B Flight 1st place: Bob Smothermon won on hole 13. 2nd place: Mits Okayama won on hole 14. 3rd place: Augie Godoy tied on hole 18. C Flight 1st place: Nazar AlJamie won on hole 14 *. 2nd place: Phil Blakesley won on hole 14 *. 3rd. place: Mike Frasier won on hole 17. Skins: Bob Smothermon, Jay Miller, Augie Godoy, Jake Oh. A Flight 1st low net: Jay Miller & Mike Frasier with a score of 59. 2nd low net: Brad York & Tom Sullivan with a 60. 3rd low net: Tony Mercado & Joe Berber with a 61. 2nd low net: Dave Walton & Tony Catizone with a 61*. 3rd low net: Jim Cvitanovitch & Phil Blakesley with a 62. Closest To The Pins... # 2, 9, 14... Jay Miller. #18... Tom Sullivan. Skins... Kevin Savala & Brett Porter... (3). Jay Miller & Mike Frasier, Phil Blakesley & Jim Cvitanovitch, Jeffrey Martinez & Lendro Valencia. Putt For Dough... Won By Ernie Anzures. It's time to contact me for entry into one of our most popular partner events. This event will start with the annual 10 minute salute to Denny at the driving range followed by 9 holes of scramble and 9 holes of best ball. Then, after the putt for dough, there's a stymie game for those that just haven't had enough. As always, the tee placements will be designated with Denny's standard operating equipment. You don't want to miss this one! Enter with a partner or enter as a single and we'll find you a partner, but enter early to make sure a partner will be available. It was a beautiful day for golf and the speed of play was highly commendable. A flight results: 1st low gross by scorecard playoff with a 73... Tom Sullivan. 1st low net with a 63... Les Horvath. 2nd low net with a 64... Brad York. B flight results: 1st low gross with a 86... Stephen Tancredi. 1st low net with a 69... James Cvitanovitch. 2nd low net with a 71... Lendro Valencia. Closest to the pins: #2: Mike Benton, 20'11". #9: Dave Walton, 36". #14: Bob Smothermon, 14' 0". # 18: Tony Mercado, 5"6". Skins: Jim Cvitanovitch (2), Phil Blakesley, Dave Walton, Tom Sullivan, Joe Berber, Tony Mercado. Putt For Dough Results: Steve Pitman, Tom Sullivan, Tony Mercado, and Mits Okayama all made the putt... Carry over to the next tournament. The next tournament will be the Denny Skraba Memorial Tournament. This is a partner's event. Some have already entered. The first nine holes will be played as a scramble. The back nine will be a partner's best ball. Let me know if you need a partner. River View's Three Club Challenge Invitational! OK, so it's actually three clubs and a putter. It has to be a putter. Sorry, I don't believe you always putt with a 1 iron. So pick which three clubs you will only be able to play the course with on Saturday, February 1, put them into a golf bag and add... 1 putter, I think we've all got it now. This tournament is open to guests. If they have a handicap. they are welcome to compete in this event. If they have no handicap, they can play to a zero and compete in the skins and closest to the pins. Or... They can play along for the fun. Our last tournament's speed of play was great. We all appreciate the efforts taken to keep up with the group ahead. This tournament will require the same amount of effort since you won't have that exact club you need to make that next bad shot. So remember... Ready golf makes it better for everyone. If you want to enter just let me know as soon as you can so I can get extra times while they're still available. It was just another beautiful day for golf here in Southern California. We had a strong field of players with some great scores, and some that were almost great, and some that were... Well, lets get to the results. A Flight winners, by scorecard playoff, with a score of 61... Jay Miller & Michael Frazier. Both Jay and Michael are our newest members. Congratulations guys! Second place with a score of 61... Tom Sullivan & Brad York. Third place with a score of 63, by scorecard playoff... Dave Kronberger & Dan Parrott. B Flight winners... Russ Godoy & Augie Godoy with a score of 57. What a father/son team! Second place with a score of 58... Les Horvath & Mits Okayama. Imagine if they were healthy. Third place with a score of 60... Dave Walton & Nazar Al Jamie. A 13... Really Dave? Closest to the pins went to... #2- Tony Catizone. #9 & 14- Russ Godoy. Nice job dad! #18- Tom Sullivan. Skins...Les Horvath, Don Zalewski (2), lendro Valencia, Joe Berber, Dave Kronberger, Mits Okayama, Gil Garcia. Putt For The Dough results... Dan Parrott, Tony Mercado, and Lendro Valencia all gave it their best, but their best drifted to the left a bit more that they thought it would. There were no three putts. $54.00 carry over. It's time to start thinking about what three clubs you'll need next month, February 1, for the River View Three Club Challenge. You only get to have three clubs and one putter in your bag. I can hear the wheels spinning. Sad note... The best round I ever shot at the view was this tournament in 1978. 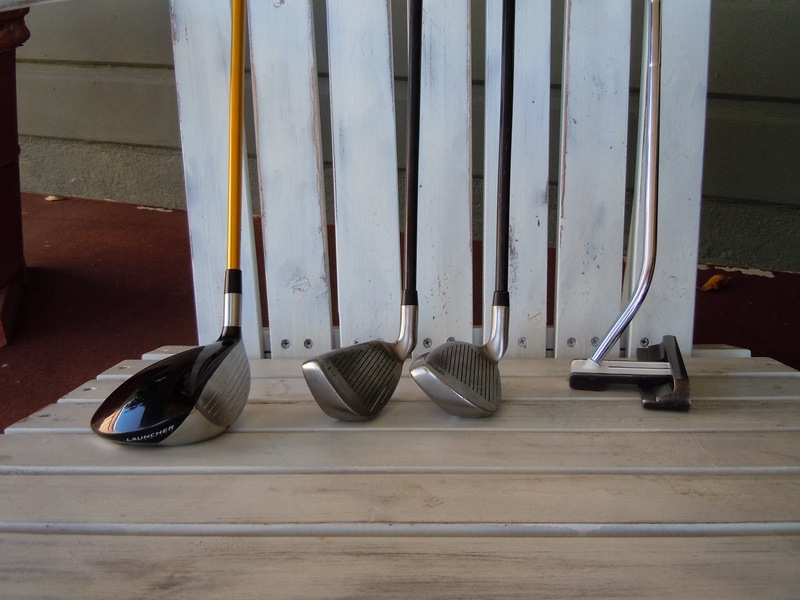 Clubs... 3 wood, 7 iron and sand wedge. Just thought you'd like to know... I was younger then.